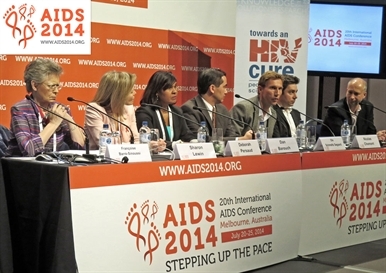 Progress along the multi-pronged path towards a cure for HIV was one of the themes at the 20th International AIDS Conference (AIDS 2014), taking place this week in Melbourne. Researchers provided updates on the "Mississippi Baby", a novel assay for detecting low levels of hidden virus in the body, and using the anti-cancer drug romidepsin to reactivate latent virus. Researchers discussed cure-related work in oral abstract sessions and at various symposia, including a 2-day pre-conference "Towards an HIV Cure" meeting organised by the International AIDS Society (IAS). Several researchers summarised their findings and offered their thoughts about future directions at an IAS press briefing on Monday. Deborah Persaud from Johns Hopkins gave an update on the "Mississippi Baby" – now nearly four years old – who just before the conference was found to still have HIV after having had an undetectable viral load while off antiretroviral therapy (ART) for more than two years. Though disappointing for the child – who has resumed ART and is in good health – "we have learned a lot from this case and it provides a strong rationale for moving forward with a clinical trial" of very early combination therapy for infants, Persaud said. "We're looking at the moment at achieving long-term remission, and how long can we go [without antiretrovirals]," said AIDS 2014 co-chair Sharon Lewin from Monash University. "We've realised in the past year that the virus can really hang around for a very long time and pop up unexpectedly." The Mississippi case "shows we need much better tools to detect HIV" in the body and "need to learn how to eliminate long-lived reservoirs." Nicolas Chomont from the Vaccine and Gene Therapy Institute in Florida reported on the development of a new assay called Tilda that – unlike current tests used in cure research – uses only a small amount of blood, is less expensive, and does not require specialised equipment. Tilda "can be implemented in pretty much any lab in the world," according to Chomont. Dan Barouch from Beth Israel Deaconess Medical Center described a study in monkeys, published this week in Nature, showing that HIV seeds itself in cell and tissue reservoirs very soon after sexual exposure – even before viral load is detectable in the blood. Very early ART reduced the size of the reservoir, but it did not prevent re-emergence of virus after treatment was stopped. "Even very early is not early enough," Barouch said. One strategy widely used in HIV cure research is dubbed "kick and kill", the idea being to reactivate latent virus in resting cells. Once the virus is "woken up" and starts replicating, it becomes visible to the immune system and is susceptible to antiretrovirals. Ole Schmeltz Søgaard from Aarhus University Hospital in Denmark described his team's research using the HDAC inhibitor romidepsin to kick cells containing dormant HIV out of their resting stage. In a small study of six people with long-term viral suppression on ART, romidepsin was indeed able to activate latently infected cells, but "it doesn’t look like [this led to] a significant reduction in the viral reservoir," Søgaard explained. Results such as these indicate that neither very early antiretroviral treatment nor agents that re-activate latent virus are likely to be enough to enable a functional cure, or prolonged time off ART without disease progression. "The Mississippi and Boston [bone marrow transplant] cases make me wonder if we will ever get rid of the entire reservoir," said Steven Deeks from the University of California at San Francisco. "We may get rid of big chunk of it...but we need a way to control what's left." Deeks predicted that the cure field will move in the direction of therapeutic vaccines or other immune-based therapies that can be used in combination approaches. "We should not oppose vaccine and cure research, and probably we will need both," predicted IAS President Françoise Barré-Sinoussi. Added Barouch, "It's two sides of the same coin."